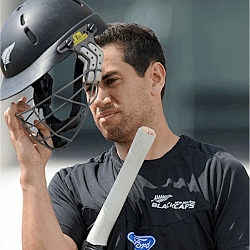 Former Black Caps skipper Ross Taylor must think he’s the unluckiest man in New Zealand cricket right now. Dropped from the squad for Tuesday’s T20 clash against Bangladesh, it’s the first time in ten years he’s been denied a place on form, rather than by injury or unavailability. It’s a bitter blow to the New Zealand veteran, whose decade in the national side has produced 16 centuries in Tests and 15 in ODIs; in the 50-over game, second only to Nathan Astle. His form returned convincingly over 2015 and 2016: despite eye surgery after racking up his sixteenth Test century against Pakistan in November, he was back in T20 action before the end of the year. For Central Districts Stags, Taylor smacked 82 off 41 against Auckland Aces on December 29, then knocked another 80 off 50 against Canterbury Kings two days later. To be in form and bluntly dropped, while other Black Caps stars like Trent Boult and Tim Southee are being diplomatically ‘rested’ for this T20 series, has got to sting. Taylor might justifiably feel hard-done by, but it’s hard to fault any of the players who edged him out. The Wellington 32-year-old has simply been a victim of the wealth of New Zealand talent currently competing for top T20 batting spots, including in-form skipper Kane Williamson. Taylor’s Stags teammate Tom Bruce, for example, has spent the past two seasons proving he has both the nous and the big batting ability to become a legend of the game: his T20 batting average last year was 47.16 at a strike rate of 172%. It would’ve been heart-breaking to see him denied his first T20 cap in this series; one that might see him win a debut Test cap in the five-day matches that follow on January 12. Likewise, Neil Broom is another batsman who got the nod over Taylor. But again, no one can claim the 33-year-old Otago Volts star doesn’t deserve his spot. His match-saving heroics in the Bangladesh ODIs last year, along with his man-of-the-series award, are proof enough of his value, but his position as a specialist T20 opener, batting 51.50 at 140%, clinches the deal. With the Stags at the top of the domestic ladder, however, at least Taylor will now be available to contribute to the hunt for their first championship in seven years. It’s probably small consolation.